You can skip this step if you dont wanna create a new shared data source. you can later embed this in report directly. Next click on "Reports" folder and add new report, this will launch Report Wizard. 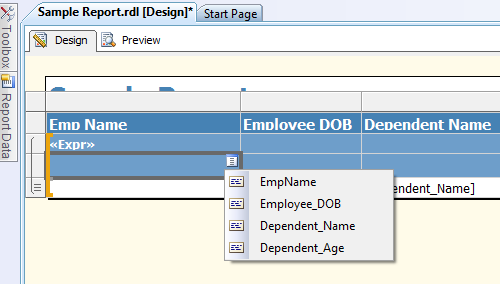 At first step you need to select an existing datasource or create a new one. Press preview tab to preview how your report looks like. For this we need to add expression in place of Employee Name. Select "Expression" from the context menu, you will get a screen as below. Enter desired expression and press OK(See below). This will give you below result. 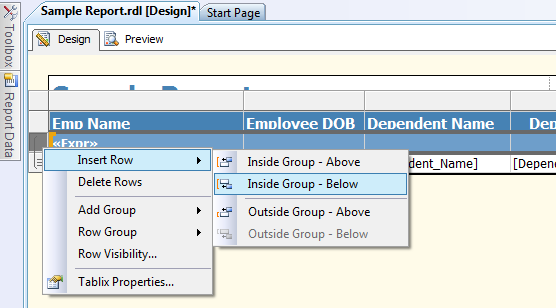 Add a new row below employee name row, as shown in below image. I am facing problem in using calendar control in reports. They are taking time in loading just the calendar control. There is no cascading requirment. I have to put just start and end date calendar controls. I need to know why it is taking time to load. Also i need to have some way to switch the years instead of traversing via month to change a year. well Aparna I don't think, I'll be of much help on this. 1. Rather than using date control, give three dropdowns(date, month, year) each for start date and end date. 2. Give a textbox where user can enter manually. both of these have there share of cons, but this seems to be only option if you don't like date control.